OZCO Ornamental Wood Ties (OWT) give you the style you want with the strength you need. OWT adds a unique accent to many projects, allowing you to customize your home for maximum impact. 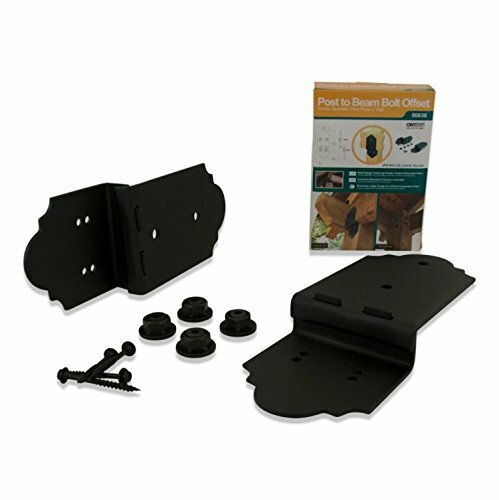 The OWT Bolt Offset Kit is designed for use with 6'' or larger posts. The revolutionary top cover plate interlocks with the ledge and adjusts to the thickness of the beam, and can be used on smooth or rough cut wood. The Bolt Offset Kit is ideal for roofs, larger pergolas, and higher rafting. All corrosion resistant fasteners are included, including the patented OWT Timber Screws. OWT Timber Bolts are sold separately. OZCO OWT have been pre-engineered for this most critical connection. Kit Includes: 2 Post Ledge Bases, 1 Plate for Top Bolt Offset, 4 Hex Cap Nuts, 4 Two Inch OWT Timber Screws, 1 Plate for Top Bolt Inline. OWT Timber Bolts SOLD SEPARATELY. 3/4" Pre-Drilling Required. Hex Head Size 3/8". Kit Includes: 2 Post Ledge Bases, 1 Plate for Top Bolt Offset, 4 Hex Cap Nuts, 4 Two Inch OWT Timber Screws, 1 Plate for Top Bolt Inline. If you have any questions about this product by OZCO, contact us by completing and submitting the form below. If you are looking for a specif part number, please include it with your message.